It is no secret that anglers have different levels of skills and they have different amounts of time available to spend on these fishing trips. For the dedicated angler, a great fish finder definitely makes life easier and provides additional versatility to play with. Nothing can be more frustrating than having high expectations and being let down because the fish finder is not versatile and does not spot all the fish swimming underneath and around your boat. 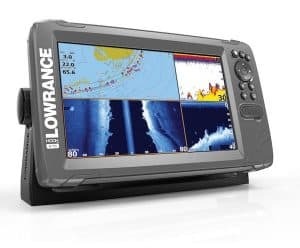 The Lowrance HOOK-9 fish finder meets the needs of even the most dedicated and avid anglers, with a larger than average screen and new advanced technological features, it comes at a reasonable price. It is compatible with virtually any transducer brand, eliminating the need to stick to Lowrance-only products and perhaps even saving you a couple of bucks on the side. Nine inches is exceptionally large for a fish finder screen, but it has the ability to simplify life significantly when in a rush. The display system works with a button-based system for navigating through the screens and the features. This makes it possible to use with gloves on. The 9-inch LED display is designed to be waterproof and has a rating of IPX7, meaning that it is waterproof for up to 30 minutes in 1 meter deeper puddles. The display also features a resolution of 800 x 480, a little crisper than many other cheaper models and versions and then it has a multi-window display that can display multiple stats at once or just the important stats and picture of the fish finder on the full screen. 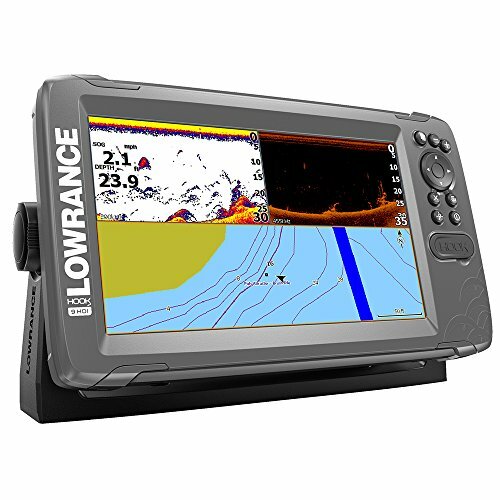 The Lowrance HOOK-9 features a CHIRP Sonar with DownScan Imaging. These both run on different frequencies. The DownScan imaging works at a frequency of 455/800 kHz, while the CHIRP sonar runs on 83/200 kHz. Switching between these frequencies can be done with a touch of a button and they will have different conical displays for different angling purposes. The lower frequencies work perfectly for dropshotting. With such complex technology used for the sonar, it has the ability to present better details of the fish on the display. It has a maximum depth range of 1000 feet and can also be used for ice fishing in the Arctic environments. The Lowrance HOOK-9 features a highly accurate GPS antenna and more than 3000 different built-in maps and locations. It also covers the coastal contours of the US up to 1000 feet, making it easy to use in any environment. The Insight Genesis features enable users to create their very own maps of locations and these custom maps can be saved with waypoints and hotspots of favorite fishing locations. Global chart upgrade options are available that include Navionics+ and the Jeppesen C-MAP MAX-N maps. Additional maps are also available for purchase if the user likes to increase their map library and have more locations to use. Advanced Signal Processing (ASP) is a staple in all Lowrance fish finders and it is designed to allow the user to focus on what is important instead of constantly fiddling with all of the settings. ASP allows the fish finder to auto-adjust to what the sonar is picking up and makes it easier to spot any debris that you avoid and keep it from damaging your boat. Advanced signal processing also contours the bottom much better and makes it easier to see any fishing arches or problems that might be awaiting you at the bottom. Learn more about the HOOK series. Quality is fundamentally important and this fish finder does bring a lot of value to your boat. The larger display makes it practically impossible to miss anything on the screen and the multi-window function enables tracking of stats to be done without having to switch between different screens too often. The design is also waterproof and lights up perfectly on sunny days when the sunning is shining directly on your screen. The only thing that might be a little frustrating is the size and this fish finder is quite heavy and large to carry around when removing it from the bracket to keep someone from stealing it. However, the ruggedness of the design ensures a lot of durability and all the features simplifies the fishing experience significantly. Versatility is certainly something this fish finder is designed for. It can be mounted on your other vessels like your kayak, but the mounting process is quite strenuous and this fish finder is designed for serious anglers going into deep water. The Lowrance HOOK-9 can be used in various weather conditions with different levels of success. The screen is perfect for ice fishing as well and since it does not have an additional ice pack upgrade, we assume that is must have already been included. The only thing you might need to upgrade is your transducer if you plan to go ice fishing. Mapping your location is crucial to not getting lost, but also reaching certain destinations with detours to certain hotspots. The Lowrance HOOK-9 has a highly sensitive GPS antenna, making accuracy a sure thing. The waypoints can easily be stored and recalled and with over 3000 different maps and the ability to upgrade them, you should quickly have an impressive library of fishing spots. The only real downside is the lack of internet connection and no app that can be used to share locations. This is found in many modern fish finders and it enables users to share their locations and hotspots with users using the same app. It is also worth mentioning, that none of the Lowrance fish finders have apps included. The Lowrance HOOK 9 actually competes with one of the fish finders designed by Lowrance with a similar display. Lowrance’s HOOK-7 is similar in design and competes at around the same price level. It is also designed for avid anglers and also features the CHIRP Sonar with DownScan Imaging. If the HOOK-9 is a little bit out of your price range, the HOOK-7 is a smaller option. It features the same quality display, but only a little smaller at 7 inches. It also includes over 3000 different maps and these can be upgraded if you need to expand your library. The HOOK-7 is certainly a great alternative option to consider if you have a limited budget. With a similar price as the HOOK-9, the Raymarine Dragonfly 7PRO with US Navionics is just a little smaller and does not have the same depth range. It features a depth range of 600 feet, making it perfect for lakes and rivers. The biggest draw of the Dragonfly 7PRO is the addition of the Wi-Fish app and this makes it possible for users to save and share their locations with other users. Lowrance might have a few flaws in some of their products, but the HOOK-9 does not expect you to overpay for these flaws. The fish finder has been reasonably priced, making it affordable for avid anglers without the budget to make a significant investment. All of the features are easy to use and access and the versatility it offers makes it worth the price. Fishing Tech happily gives the Lowrance HOOK-9 a rating of A and we would also recommend it to avid anglers. It can also be used by occasional anglers looking to commit and eventually reach the top level of fishing.